Level 3 – unfortunately there are still some study carrels that have not been carpeted and we are awaiting an estimate of when they will be available. 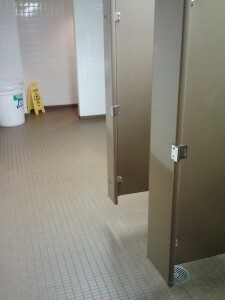 Level 1 & Level 2 Bathrooms – are currently off line and are being worked on. The demo should be mostly done and they will be working on the new tiles soon. 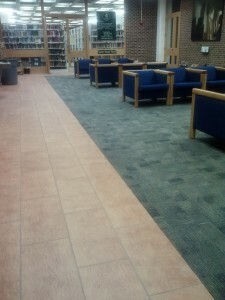 Plaza Level – They made record time in this area and are done with the carpeting behind the iDesk. Staff will be moving back into their offices through the early part of next week. Level 1 – For those who have been on Level 1, you will see that although it is in a constant state of motion, they are moving along rapidly and that is great news. The majority of the North side is done and they will continue in a counter-clockwise pattern around the floor. The Q Center is still able to follow their summer hours, they are just on the South side of the floor. If you are looking for the Digital Learning Center, Steve Park is temporarily located in the staff area of Level 1. If you need his assistance, please stop by the help desk on that floor. If you are anywhere near the 1st floor of the library this morning, you are certainly aware of the next phase of the flooring renovations. The crew has begun to remove the carpeting on Level 1, starting with the electronic classrooms on the North side of the building. They are also starting on some of the carpeting leading to those rooms. Today and tomorrow we expect some loud periods when they use the machine so if you are honestly looking for some quiet, this is not the place to be. The sound is muffled as you climb higher into the building. We do have earplugs if you wish, just ask any of the service desks. Traffic patterns on the floor will change, but we will do our best to keep all of the computers and other services on the floor accessible. Levels 1 & 2 Restrooms are closed. Bathrooms are located on Level B, Plaza, Level 3 and Level 4. We are finally able to open up the bathrooms on the 4th floor. We expect those on the 3rd floor to be ready by the end of the day. That means that they will start on the 2nd Floor bathrooms today, so those will not be available for the near future. The men’s room on the 1st floor is also not available. While there has been progress made, the timeline for completion of all of the public flooring changes will no longer be by the end of the summer. With that said, let’s tell you where we have made progress. The 4th floor lobby is open. There are a few small details left, but if you have been up there I think you will agree it looks great! The addition of ceramic as a boarder around the room makes the space look larger, and the wear and tear on those high traffic areas will be much less as we move forward. 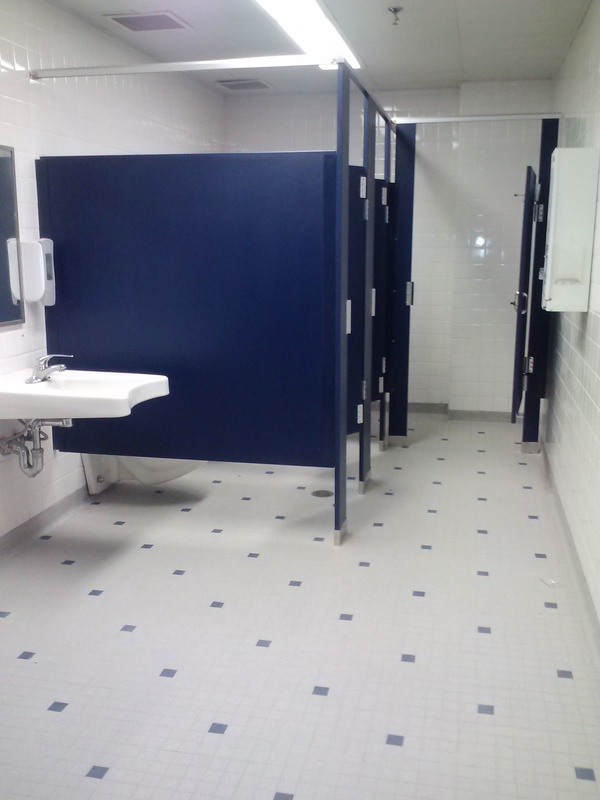 3rd & 4th floor bathrooms – The new tile work is almost completed and once the partitions are installed they will be ready for use again. We hope to have that ready by mid-week next week. 3rd floor carpeting – The North side is open. Much of the furniture that can be, has been put back including the serpentine tables (which also received some maintenance improvements as a plus!) They will be electrified shortly. They are working on the South side and things are moving along now that they have a good system. They anticipate being done by mid to end of next week. Bookworms – There is a small section of Bookworms that is missing tile due to some water damaged wood. It has obviously not affected services but if you noticed it, we hope to have that all set soon. Plaza Level – Once the crews finish up on the third floor, they will come down to the Plaza Level and work in the space behind the iDesk. There will be minimal service interruptions during that time, however staff that work back there will be relocated temporarily. If you need to contact the staff, including the reserve staff, we suggest e-mailing them as the most direction option. You can also stop at the iDesk and they can give you their temporary locations. During this time, the Auriemma Reading Room will be closed to patrons. We know this is a popular spot but it will temporarily hold furniture and staff that needed to be moved from the office areas. We expect it will be closed through August 7th. Level 1 – The next area they will begin work on is the area around the main staircase on level 1. This will be orchestrated to allow as much access to the floor during this time. We thank you so much for your patience through this project!